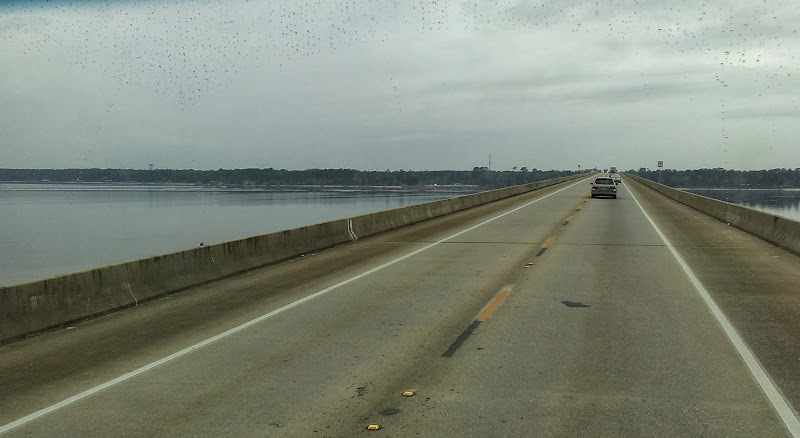 On the morning of the 11th, it was time to leave Ft. Pickens, heading for our next destination – Rainbow Plantation in Summerdale, AL. Although our stay at Ft. Pickens was enjoyable because there was so much to do, I can’t say I was sorry to be leaving the campground there. As we leave we always ask ourselves: do we like this place enough to stay here again? In this instance, our answer was most likely not and definitely not on a weekend. But in the event we ever did come back, we would try to reserve a site in loop A – loop A is smaller and more private, plus the sites there appear slightly longer and perhaps better suited for big rigs. The weather forecast for the day wasn’t great, calling for periodic showers and sure enough as soon as we left the campground around 10:45 am, it started to rain. Luckily it was another short drive, about 50 miles (am I beginning to sound like a broken record?). 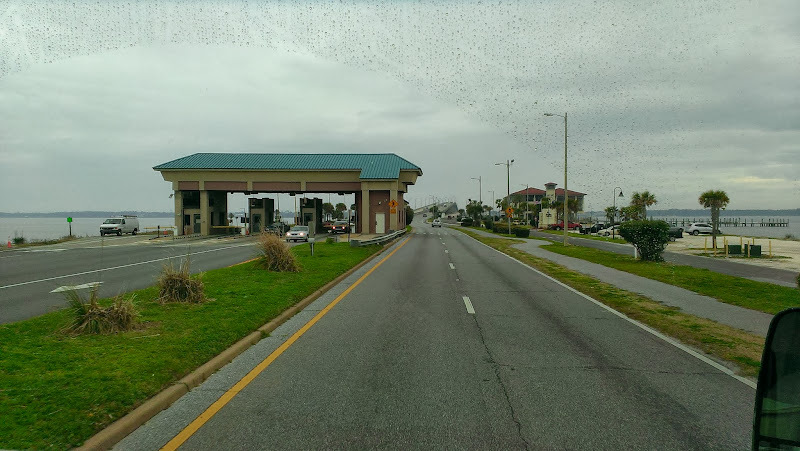 At the end of Fort Pickens Road, we took a left on FL-399 and crossed the causeway to Pensacola, then followed FL-30/US-98W all the way to Foley, AL where we turned north onto The Foley Beach Expressway, then a very brief stint on AL-59N to CO-28W and 5 miles later we were there. 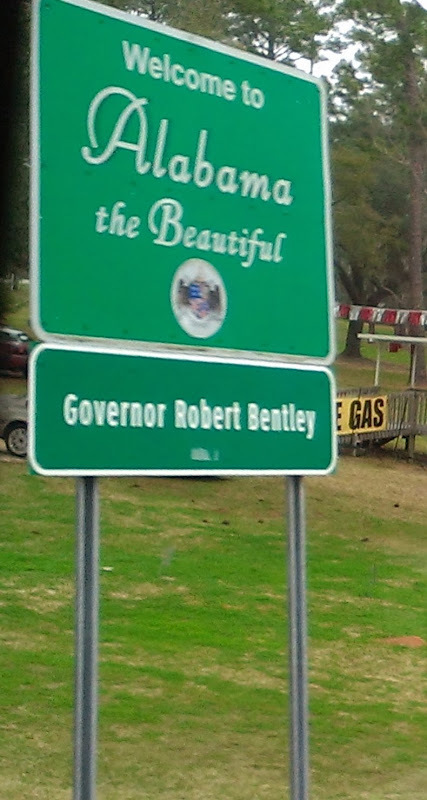 Except for some occasional rain, the drive was uneventful and we arrived at Rainbow Plantation around 12:10 pm. We had been told that the office is closed between 12:30 pm and 1:30 pm so we had planned our arrival time accordingly. We first became aware of Rainbow Plantation three years ago from fellow bloggers Margery and Paul of Living Our Dream – thanks guys! 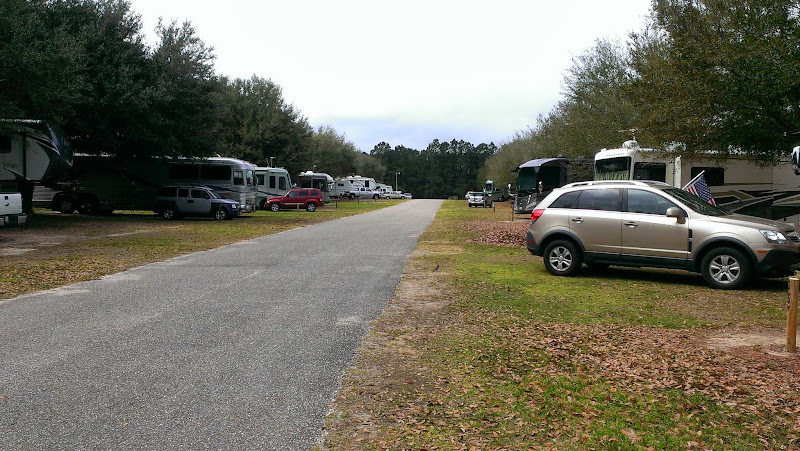 Rainbow Plantation is one of the RV parks managed by the Escapees RV Club. 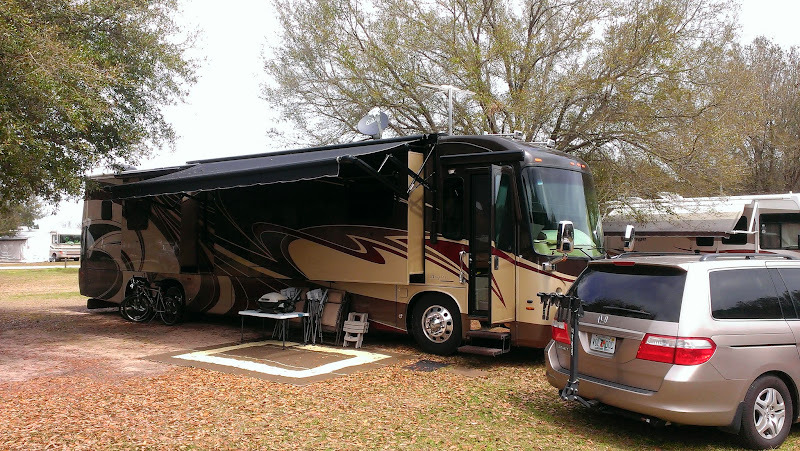 When we attended the Tampa RV Show in January, the Escapees booth was one that we visited. Since they were offering a 50% discount off their usual $70 membership fee and we had been talking about joining anyway, we decided to go for it. 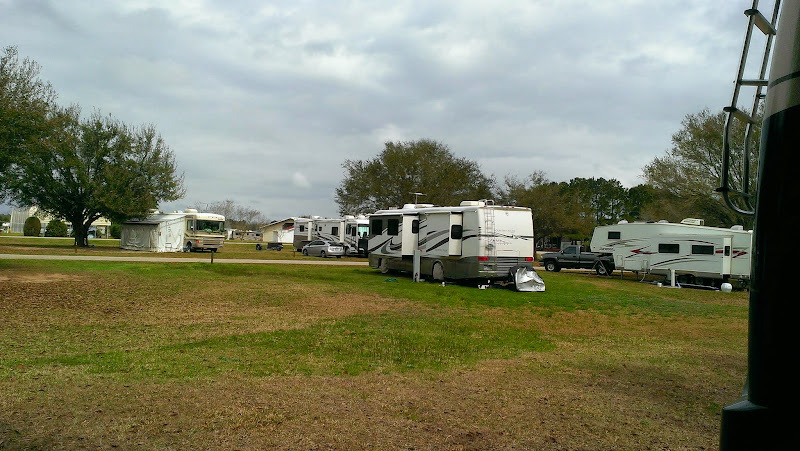 What the heck, what’s one more RV club membership? The best thing is we’ve already recouped our membership fee during this one stay. We also got our first Escapees hugs! Although the Escapees club offers a variety of benefits which you can read about on their website, our primary reason for joining was the reduced rates at their parks and their Smart Weigh program. Escapees also offers a mail forwarding service with a “home” address based in Texas, but we are already Florida residents and quite happy with St. Brendan’s Isle which we have used for over 3 years now so we are not planning to take advantage of that particular benefit. As Escapee members, our rate at Rainbow Plantation was $19 per day (regular rate is $26.50) plus an extra $1.00/day for a 50 amp site. Anyway, after we checked in, we drove to our site and settled in. Rainbow Plantation has 87 full hook up sites with water, electric and sewer as well as 22 ERPU (Escapees Rainbow Plantation Unlimited) sites and 10 lease sites. Be aware that only 50 sites have 50 amp electrical service (consult the park map to see which ones), available wi-fi (for a fee), a swimming pool, laundry facilities, and a large clubhouse. According to the calendar they gave us, they had a number of activities going on each day. We had planned on going to the Saturday morning breakfast from 7 am to 9 am but being the lazy louts that we are we didn’t make it in time! Most of the reviews we had read about Rainbow Plantation were very favorable but we were still very pleasantly surprised when we drove to our site. 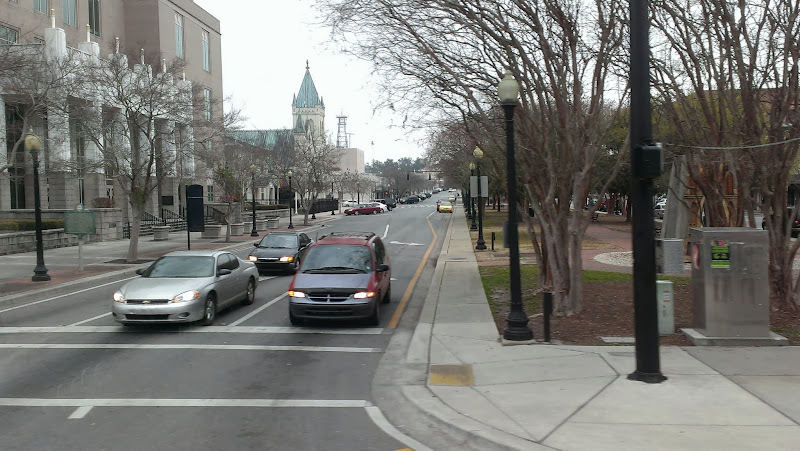 Roads are asphalt and wide, allowing for easy back in. Sites are grass and are very large and spacious with plenty of room between us and our neighbors. And despite the live oak trees, we had good satellite reception. Only complaint was that it was constantly raining live oak leaves this time of year so it was hard not to track them everywhere! Of course, this was totally beyond the control of the campground staff! After staying at the rather noisy, somewhat cramped and crowded Fort Pickens campground, it was a nice peaceful change of pace. Very quiet with lots of friendly people. When Rob went to put out our awning, it caught on one of the branches on the tree so he had to use a pole to push up the branch. Our next door neighbor told us that we could ask to have the maintenance guy in the office trim the branch but it was just a small one and Rob ended up doing it himself. Earlier in the week, Rob’s aunt and uncle, Linda and Herb who are staying at Magnolia RV Park (Mannich Ln.) about 10 minutes south and had invited us over for supper. We hadn’t seen them since we were together at Disney World back in January so it was great catching up and sharing stories about our travels. Supper was delicious as usual – hamburger stroganoff over noodles, salad and apple crisp for dessert! Fun evening! Note that Magnolia RV Park was $30 per night short term so we decided not to stay, but has very favorable monthly rates at about $275. More about our stay in Summerdale in our next post.